Easy to integrate and commission, yet highly cost effective, the EFit power controller provides no compromise control for resistive and infrared heating elements. 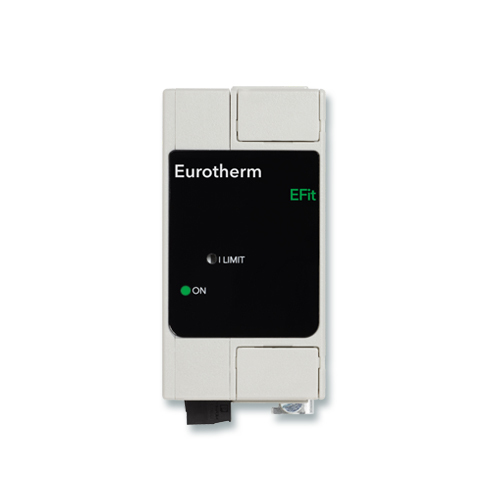 Easy to integrate and commission, yet highly cost effective, the EFit power controller provides no compromise control for resistive and infrared heating elements. Ideal for all heating applications and fully compliant to international quality, immunity, and emissions standards, Efit achieves outstanding stable, precise control in the most demanding industrial environments, even when cabinet space is at a premium. Some Industrial processes such as heat treatment require precise temperatures in order to comply with regulations and it is imperative that the workpiece temperature is kept within specific limits. This can be difficult to achieve in industrial plants where the operation of large machinery can cause fluctuations in the voltage supply. In the case of resistive heaters a variation of 10% in the supply voltage will generate a 20% variation in the power to the load, resulting in undesirable temperature fluctuations. EFit contains built in compensation that continues to apply stable power with better than ±2% linearity at the boundaries of the load, even during fluctuations in the supply. The result is a reliable, repeatable heating process and high quality end products compliant to demanding heat treatment standards. Straightforward connection and commissioning, combined with a compact format to maximise use of cabinet space makes EFit the perfect fit for power control in both new and retrofit applications. Designed to give a fast stable response even in heavy industrial environments, EFit will enable you to run continuously optimised heating processes with minimum down time. This faster throughput improves OEE (Overall Equipment Effectiveness), helping you achieve your KPIs (Key Performance Indicators). EFit offers built in power stabilisation and a variety of firing modes for different types of load, which lead to energy savings and higher quality end products when compared to more basic power controllers. EFit power controllers offer peace of mind for installers working in a global environment where industry regulations form an essential part of the engineering supply chain.